The Azden 330LX UHF is a powerful dual-channel UHF wireless combo-microphone system for camera-mount applications. 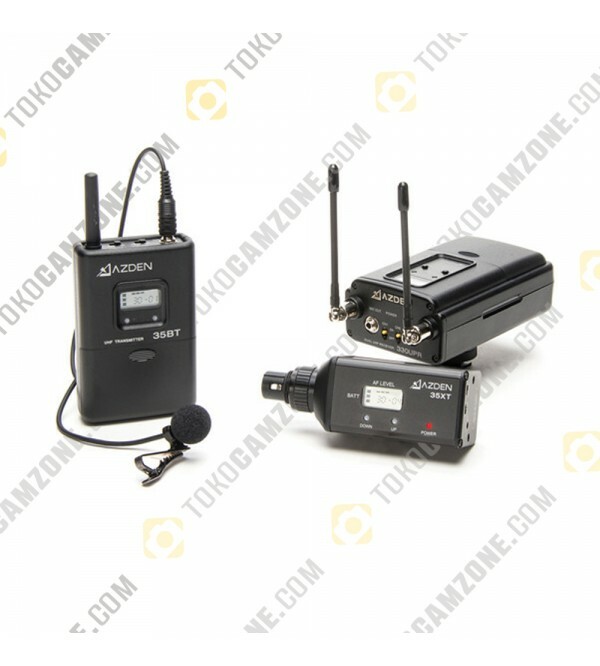 The system consists of Azden's 35BT bodypack transmitter, EX-503 lavalier microphone, 35XT plug-in microphone transmitter, and 330UPR portable dual-channel diversity receiver. The inclusion of both bodypack and plug-in transmitters, allows users to operate both microphones simultaneously. With a feature set that includes 188 user selectable UHF frequencies, pivoting high-gain diversity antennas, and LCD digital display, the 330LX is guaranteed to meet the demands of consumer and professional video applications alike. The 330UPR receiver features main and headphone monitor outputs, and a removable shoe-mount adapter. Both the transmitter and receiver operate on standard AA alkaline batteries (not included).